Wounded Times: Navy Veterans Help Others Ride "One More Wave"
Navy Veterans Help Others Ride "One More Wave"
“Getting people out of the hospital, off the meds, out of the dark place they’re in, treating them like the men they are and not talking to them like kids ... I mean, really, depending upon where some guys are at, it could save their life,” McFadden said. One More Wave volunteers Micah Shanahan, left, Kyle Buckett and Alex West at Shanahan's Addict Surfboards in Sorrento Valley. Alex West and Kyle Buckett didn’t become friends until two years ago, but their lives have long followed parallel paths. 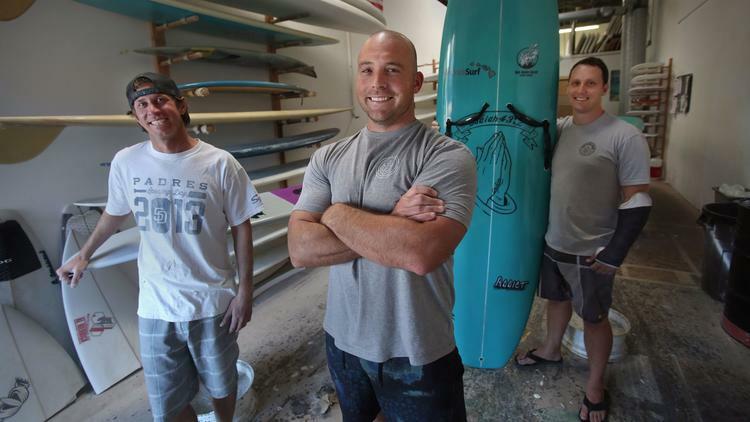 Each of the San Diego men has served more than 15 years in the Navy, each completed more than a dozen deployments in Iraq and Afghanistan, and each is passionate about the healing power of surfing. Together, they’re now the volunteer force behind One More Wave, an 18-month-old San Diego nonprofit that provides free custom-designed surfboards to wounded military veterans. Over the past year-and-a-half, West, Buckett and surfboard shaper Micah Shanahan have delivered boards to 31 veterans who’ve lost limbs in combat, suffered disabling injuries or struggle with post-traumatic stress syndrome (PTSD). Another 14 boards are now in the finishing stages at Shanahan’s Addict Surfboards in Sorrento Valley.